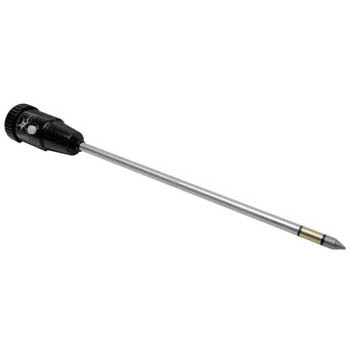 The Accurate pH 8 is the professional pH and Moisture Meter with 12” Probe. Now anyone can check soil pH at multiple depths!! The probe is 12” long is perfect for extra large planters. Operation is simple. Clean the electrodes and place the meter into the soil. A pH reading is automatically displayed. Press the white button and a moisture reading is displayed. Clean the electrodes before each use. It works by utilizing the electronic ground field effect of the earth and two dissimilar metals. No batteries are required. Never needs calibrating.